Justin Gabriel Hurwitz (born January 22, 1985) is an American film composer and a television writer. He is best known for scoring the 2016 film La La Land. He also scored Damien Chazelle's three other features, First Man, Whiplash, and Guy and Madeline on a Park Bench. For La La Land, he won two Academy Awards: Best Original Score and Best Original Song (for "City of Stars") as well as the Golden Globe Awards for Best Original Score and Best Original Song (for "City of Stars"), and the BAFTA Award for Best Film Music. For First Man, he won the Golden Globe Award for Best Original Score. Hurwitz was born in California, the son of Gail (née Halabe), a professional ballet dancer turned registered nurse, and Ken Hurwitz, a writer. His family is Jewish (from Russia, Poland, Damascus in Syria, and Beirut in Lebanon). His family moved to Wisconsin in 1998 where he attended Nicolet High School. Hurwitz attended Harvard University, where he was roommates with director Damien Chazelle. They collaborated on a student film that would become Guy and Madeline on a Park Bench, which was released in 2009. While in school Hurwitz was a member of the Harvard Lampoon and was an original member of the indie-pop band Chester French with Chazelle. After college, Hurwitz and Chazelle moved to Los Angeles where Hurwitz wrote comedy for the sitcom The League and one episode of The Simpsons. Thanks to the success of Guy and Madeline, they were able to obtain financing for their next collaboration, the 2014 film Whiplash – with Hurwitz scoring the film and Chazelle writing and directing. Hurwitz also scored Chazelle's 2016 film La La Land, for which Chazelle won the Oscar for Best Director and Hurwitz won two Oscars for Best Original Score and Best Original Song. 2011 The Simpsons Writer Episode: "The Falcon and the D'ohman"
^ a b c d e f "California Birth Index, 1905-1995 (Database online)". Ancestry.com. State of California Department of Health Services, Center for Health Statistics. 2005. Retrieved 2 Aug 2017. ^ Jewish Weekly: "The tribe goes to the Oscars" by Nate Bloom. February 13, 2017. ^ D'Alessandro, Anthony (December 10, 2016). "How 'La La Land' Director Damien Chazelle, His Team & Lionsgate Faced the Music & Resurrected the Original Hollywood Musical". Deadline Hollywood. Retrieved December 12, 2016. ^ "'Moonlight' Named Best Picture by L.A. Film Critics". Yahoo!. Retrieved December 12, 2016. ^ Orr, Christopher (December 9, 2016). "The Novelty and Nostalgia of 'La La Land'". The Atlantic. Retrieved December 12, 2016. ^ a b Bryan Abrams (September 23, 2014). "Whiplash Composer Justin Hurwitz Settles the Score". wheretowatch.com. ^ "Justin Hurwitz wins best original score in a motion picture at Golden Globes". The Hollywood Reporter. ^ Bloom, Nate (February 13, 2017). "The tribe goes to the Oscars". J. The Jewish News of Northern California. Retrieved June 5, 2018. 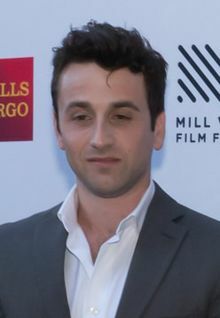 ^ a b c d e Jewish News of Northern California: "News go to the Oscars; Justin Hurwitz's proud Marin mom; etc." by Nate Bloom. February 27, 2017 |"Both my children are very proud of their Middle Eastern heritage and culture"
^ Levy, Piet (February 17, 2017). "Oscar-nominated 'La La Land' composer Justin Hurwitz got his start in Milwaukee". Milwaukee Journal Sentinel. Retrieved June 5, 2018. ^ Bloom, Nate (February 23, 2017). "The tribe goes to the Oscars, 2017". Jewish Standard. Retrieved May 20, 2018. ^ Chris Foran (January 9, 2017). "Nicolet's Justin Hurwitz wins 2 Golden Globes". Milwaukee Journal Sentinel. ^ Phares, Heather. "Chester French - Biography". Allmusic. Retrieved 2009-07-15.